I was raised on the King James Version of The Bible (the good ol’ KJV). In addition to its spiritual tutelage, this translation quite nicely programmed my brain with archaic language structures, a blessing for which I am eternally grateful. Because, apparently, the distinctions between thou/thee and ye/you are not all that easy to pick up or keep track of (to say nothing of the 2nd and 3rd person agreement markers on verbs). My parents taught me to pray using thou and thee to address the Lord. It’s a custom in my religion, though members follow it to varying degrees depending on how comfortable they are with these archaic pronouns (and there’s certainly nothing wrong with addressing Him with the modern you). We even hear on occasion that use of this bygone form of address shows a heightened reverence and respect toward deity. By its very nature, archaic language, especially that associated with religious texts, takes on rhetorical features of formality, respect, perhaps even antiquated stuffiness. The thou/thee/thy/thine of yesteryear, however, was anything but formal. In the Old English period, the distinction between thou/thee and ye/you (or þu/þe and ge/eow, as they then appeared) was simple. Thou/thee referred to one person. Ye/you referred to more than one. The singular/plural distinction between these two sets of pronouns suffered a heavy blow in A.D. 1066. For all you non-linguist, non-historians out there, that was the year Guillaume le Bâtard decided he’d had enough of his derogatory surname and crossed the Channel. He slaughtered Harold Godwinson at the Battle of Hastings, and called himself William the Conqueror from that point onward. And he brought his Norman French with him, forever changing the linguistic landscape of the British Isles. This familiar/polite distinction shows up in Middle English. Thou shifts from being merely singular to also indicating a close relationship. Ye picks up the slack for singular polite communication (and quickly gets absorbed into its object form, you). And so begins the downward spiral of thou into obscurity. Once politeness came into play, the familiar form fell out of use. It was already well into its decline in the 1520s when William Tyndale implemented it in his defiant English translation of the Bible. It was positively archaic in 1611 when the KJV was published. But since the King James scholars lifted their translation almost wholesale from Tyndale, its appearance there should shock no one. Tyndale was a canny scholar, inspired, enlightened, determined, and far-seeing. Perhaps he used thee/thou/thy/thine simply to distinguish singular vs. plural pronoun translations. I prefer to think he chose his pronouns deliberately, though, that he recognized their colloquial use and the relationships they implied. I respect the modern sense of reverence and formality that surrounds this archaic case, but peeling back that layer to the history that lies beneath communicates an added meaning for me. In addressing my God with thou and thee I acknowledge a kinship, an exquisitely personal relationship with the Only One who knows me perfectly, the Only One with whom politeness gives way to loving familiarity. Those simple bygone pronouns, for me, stand as a symbol of the Lord’s grace, and of the beautiful, individual connection that binds me to Him. Sometimes, politeness isn’t everything, and formality is only a façade. It never fails to amaze me the outrage that people can muster up about language use. An example from the recent past lies in the innocent and well-meaning word hopefully. The English language has a fairly robust tradition of creating sentence modifiers from words and phrases in its lexicon. See surely, certainly, clearly, curiously, oddly enough, be that as it may, however, regardless, and so forth. Syntactically, these words and phrases shift from a lexical to a rhetorical meaning when they enter the sentence modifier position (the Complementizer Phrase, found at the head of our minimalist CP-TP-VP sentence structure). Oddly enough, she swore like a sailor ≠ In an odd enough manner, she swore like a sailor. Regardless, I can’t come to the play ≠ Without regard, I can’t come to the play. Why, then, the great fuss over hopefully? The first attested use of this word as a sentence adverb comes from the 1930s. It gained popularity in the 1960s, and that’s when chaos erupted, so to speak. The grammar gatekeepers did not like it. They denounced it in print. They blamed the Germans (yes, really). When it crossed over the pond, British gatekeepers derided it as an Americanism. Strunk & White (1972) declaimed it. The outrage multiplied for a decade and more until it reached its peak in the mid-1970s. And then it atrophied. Scholars who had denounced its use resigned themselves to inevitability. Some of them retracted their position. Some even decided to champion the word. And yet, decades later, the rancor against it lingers. Hopefully that third source doesn’t mind me quoting them here. I mean, hopefully they understand by now that the English language is fluid, that it likes to change and that this is hardly the worst infraction it’s performed in its thousand-year history. Hopefully. Because I’m pretty sure this one’s here to stay, folks. At least for a few more years. hopefully. Dictionary.com. Dictionary.com Unabridged. Random House, Inc. http://dictionary.reference.com/browse/hopefully (accessed: February 01, 2016). hopefully. Dictionary.com. Collins English Dictionary – Complete & Unabridged 10th Edition. HarperCollins Publishers.http://dictionary.reference.com/browse/hopefully (accessed: February 01, 2016). hopefully. Dictionary.com. Online Etymology Dictionary. Douglas Harper, Historian. http://dictionary.reference.com/browse/hopefully(accessed: February 01, 2016). It’s a big, complicated word, “linguistics,” stuffed with technical concepts and broad theories. If writing is your craft, though, this particular study could well be your best friend. 1. Linguistics is the study of language structure and use. It is not full language acquisition. Don’t ask a linguist how many languages he or she speaks, because you’ll get the stink-eye in return. The purpose of linguistics is not to learn multiple languages. It is to study and define the patterns that occur within a language and across multiple language families. This makes it is the perfect discipline for any writer who wants to get elbow-deep into the craft. 2. Linguistics is a descriptive discipline, not a prescriptive one. It never ceases to amaze me how prescriptive “creative writing” can be: Don’t use this. Don’t do that. Write this way, not that way. These days, creative writing instruction seems to focus on the “how,” the rigid application of language use. In contrast, Linguistics focuses on the “why,” the doctrine. It teaches the underlying principles that govern language use and, as such, can cue a writer on when it’s appropriate to ignore prescriptive counsel or to flout a general rule. 3. 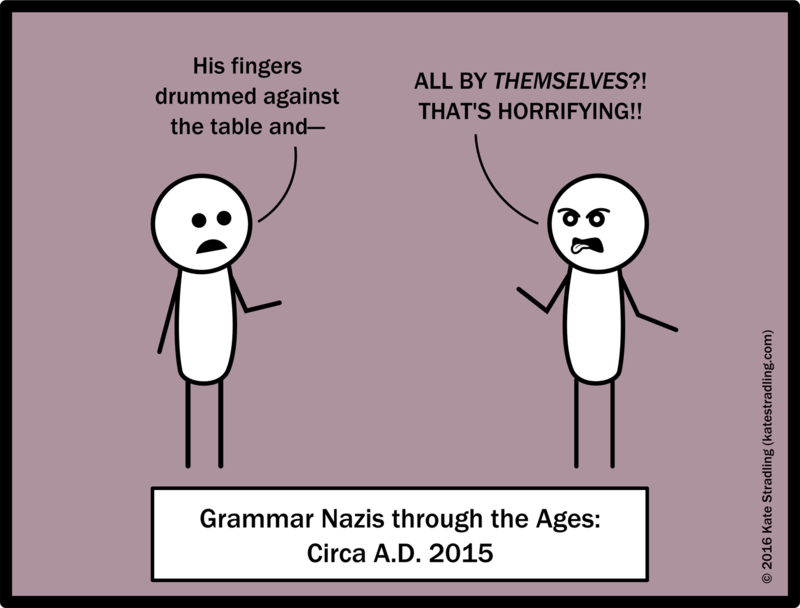 Linguists are not Grammar Nazis. Again, linguistics aims to describe language use, not prescribe it. Because of this, linguists might exude a somewhat smug moral superiority over the petty grammar “advocates” that pepper the Internet and elsewhere. Linguists know the rules (quite intimately, in most cases) and love to observe when and why those rules get broken. They don’t want you to check your grammar usage around them, which is probably the most convincing reason that you should. Where a Grammar Nazi will correct your every little flaw and dictate which words you should or should not use, the linguist’s outlook is more a “live and let live,” stress-free state of mind. And because no one, not even the most stringent of Grammar Nazis, gets language 100% right all the time, the laissez-faire approach is much more logical. Besides, who doesn’t love exuding smug moral superiority? 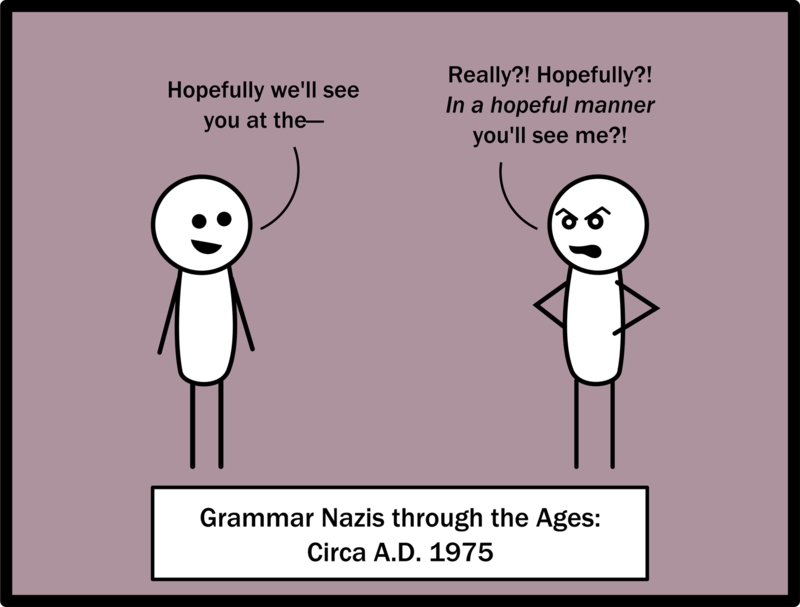 Put down your brickbats, Grammar Nazis, and delve into true language proficiency. 4. Linguistics has multiple fields that can be useful to a writer, especially a fiction writer. Phonology/Phonetics: the study of the different sounds in language. Every language has its own phoneme inventory, and phonetic environments create variations called allophones. This field includes regional and foreign accents as well as speech impediments and slurring, and can be an incredible tool to show characterization. Additional writing tools: stress, alliteration, assonance, metathesis, onomatopoeia. Morphology: the study of the smallest units of meaning in language, called morphemes. These are the building blocks for word creation and include affixes, roots, and grammar markers (such as the ‘s on a possessive noun). Writing tools: wordplay, portmanteaus, nonce words; J.R.R. Tolkien uses an aberrant morphology pattern in Gollum’s speech to reinforce his disconnect from society; Louis Carroll combines morphemes from separate words to create new ones (e.g., “chortle” from “chuckle” and “snort”). Morphology can also serve well in world-building, particularly when it comes to place names. Syntax: the study of sentence structure and parts of speech. Seriously, what can I say about this? You can’t write without syntax. Writing tools: verbing, word order, parataxis vs. hypotaxis vs. embedding, fragments and run-on sentences. If you’re a writer, syntax is your bread and butter, and you’d be well served to delve into its depths. Semantics: the study of meaning. Writing tools: metaphor, ambiguity, malapropisms, double-entendres. Semantics takes nuance into consideration and helps create the atmosphere associated with any work of literature. Is your narrative dry or lush? Purple prose or objective sparseness? 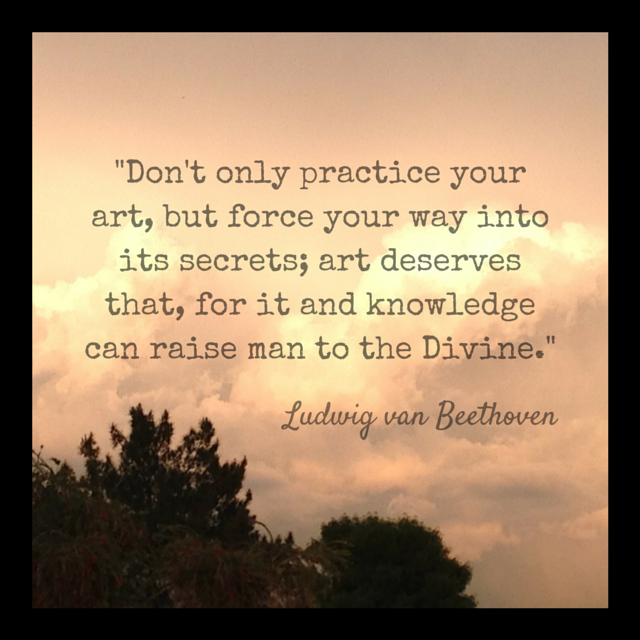 Semantics can introduce multiple layers of meaning and set the tone of the piece. Pragmatics: the study of communication. Writing tools: the big word with Pragmatics, insofar as I’m concerned, is DIALOGUE. But it’s not just character-to-character dialogue. Writers create a dialogue with their readers. Pragmatics includes intent vs. result, whether a message was properly received, and whether the speaker even meant for that message to be properly received. Politeness, deception, relevance, the meaning behind a certain intonation or inflection: all of these fall into the field of Pragmatics. This is the garden path where all aforementioned fields come together to play. I cannot say enough about the usefulness of pragmatics in creative writing. Typology: the study of patterns across multiple languages. Writing tools: foreign language structures and features; those really ambitious writers who want to create a new language entirely can look to typology as an apt starting point. Language Acquisition: the study of language learning. Writing tools: speech patterns of children (first-language learners) and speakers of other languages (secondary-language learners), including phonetic approximation and vocabulary acquisition. We’ve all read that story where the supposedly normal 2-year-old speaks with unnatural distinction, or the foreigner stumbles with simple vocabulary but pulls out complex verb tenses. Don’t be that writer. Language acquisition is systematic and predictable. Historical Linguistics: the study of language change over time. Writing tools: etymology, archaic case endings and speech patterns. This is my favorite field of linguistics. It provides such a nice template for creation, and it softens one’s inclinations toward prescriptivism. It’s difficult to demand that language use be kept to one specific pattern when you’ve glimpsed all the other cycles it’s passed through to get there. In fact, it can do so from multiple angles. In Syntax, “showing vs. telling” involves the theta-roles assigned by verbs. Pragmatics highlights “showing” through manner and relevance of communication. Instead of the narrow, “do this, not that, use this verb not that one” instruction that occurs with creative writing classes, these linguistic fields provide the inner workings of the language, thus allowing writers to self-identify “tell” prose and “show” prose and strike a balance accordingly. 6. Linguistics has a steep learning curve, but it’s worth the climb. The discipline is rife with jargon, a “restrictive code” to talk about restrictive codes (among other phenomena). This is nothing more than language used to describe language. Terms and usage will be unfamiliar at first, but don’t get discouraged. Syntax is probably the easiest place to start, because most people are at least familiar with parts of speech. Hardest place to start would be Pragmatics, where “Colorless green ideas sleep furiously.” And yet, from a creative standpoint, Pragmatics is probably the best field to tackle, simply for how it broadens one’s concept of language and its endless possibilities. 7. As a writer, you’re already using linguistic principles. You’re probably using many of them subconsciously. Ultimately, as language users, the principles of linguistics are already written in our brains. It’s just a matter of identification. Do you have a character that spouts off $5 words to assert personal authority/intelligence? That’s Pragmatics with a dash of Historical Linguistics. Foreign accents? Phonology and Language Acquisition. Deceptive double-speak? Syntax, Semantics, and Pragmatics. None of these fields exists in a vacuum, and no literature exists without them. Also, as an apology for the click-bait title on this article, a bonus! 8. Linguists love puns and other corny language jokes. It’s true. The worse the pun, the more they adore it. Check out the Linguistics Llama for undeniable proof. If you think that’s clever, or you want in on the jokes, Linguistics might be the discipline for you! This post covers two essential constructs most commonly associated with the verb to be. Demonstrate understanding of copulas and existentials. Eliminate the existential construct in favor of a stronger subject and main verb. In English, the term “copula” (or “linking verb”) refers to a verb that links a subject and a subject predicate. (The subject predicate, as indicated by its name, takes a nominative case.) The copula serves as a sort of grammatical placeholder and holds little lexical meaning despite its grammatical and rhetorical purpose. 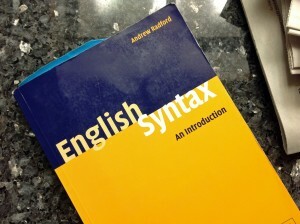 My favorite syntax resource, Radford’s English Syntax: An Introduction. The discussion in this post requires a different view of language structure. For a deeper understanding, I refer you to Andrew Radford’s English Syntax: An Introduction (ISBN 0521542758), particularly pp. 190-193 . Much of this post draws from that source. Identify the theta-roles assigned to nouns by verbs. Revise Passive Voice from sentences by using verbs with alternate theta-role assignments.